WHEN LAWYERS SCREW UP: IMPROVING ACCESS TO JUSTICE FOR LEGAL MALPRACTICE VICTIMS, by Herbert Kritzer and Neil Vidmar. Lawrence: University Press of Kansas, 2018. 248pp. Cloth $45.00. ISBN: 978-0-7006-2585-7. 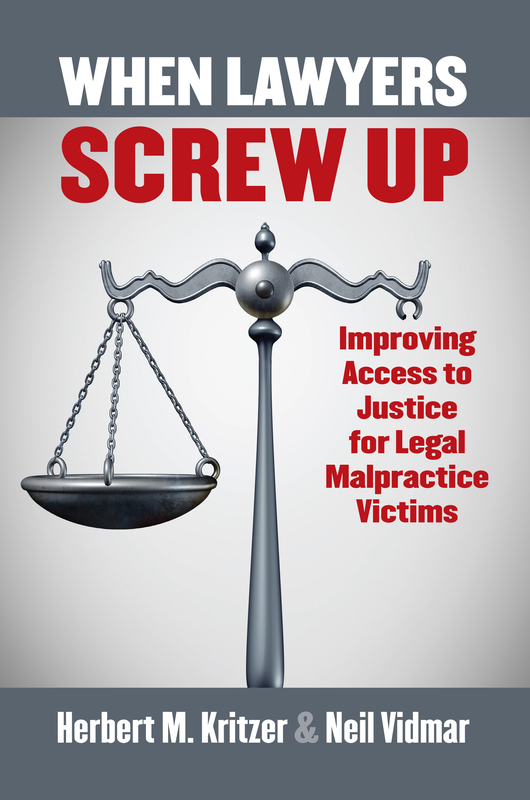 In Herbert M. Kritzer and Neil Vidmar’s recent book, WHEN LAWYERS SCREW UP: IMPROVING ACCESS TO JUSTICE FOR LEGAL MALPRACTICE VICTIMS, the authors embark on a groundbreaking and comprehensive study of claims of malpractice by lawyers in the United States. By investigating the types of claims that are made and the resolution of those claims, the authors provide a portrait of the claims involving lawyers’ professional liability (LPL), or legal malpractice. Given the dearth of scholarship on malpractice litigation outside of the context of physicians, this study is an invaluable contribution to our understanding of the nature of malpractice by lawyers in America. The authors use a mixed-methods approach to consider several facets of LPL, including what factors contribute to legal malpractice claims, how the claims are handled by relevant actors like tort lawyers, insurance defense lawyers, and insurance companies, and the overall outcomes of these claims. In addressing these areas, the authors advance the theoretical argument that there are “two-hemispheres” in the world of legal malpractice: one focused on claims arising from legal work conducted for clients who are individuals or small businesses, and the other from claims that stem from work done for large corporations (p. 4). It is this theoretical argument, supported with ample evidence throughout the book, that is perhaps this book’s greatest contribution as it sheds much-needed insight onto the immense disparity in the access to justice available for victims of legal malpractice. In Chapter 1, the authors begin by noting the relative paucity of research and scholarly attention devoted to legal malpractice, especially when compared to the literature on malpractice by physicians and surgeons. They then present their research question of investigating the nature of legal malpractice claims and outline the “two-hemispheres” argument for understanding these claims in the United States. This theory is based on the understanding that the kinds of cases handled by large law firms with mostly corporate clients are markedly different from those taken by legal practices that primarily serve individuals or small business. Naturally then, the kinds of mistakes and errors made by lawyers and the context of that potential legal malpractice varies along this fault line as well. This is an important distinction, and one the authors refer back to throughout the book, as it provides crucial insight into the causes of the disparity in access to justice for victims of legal malpractice between the two hemispheres. Legal practices serving large businesses are more likely to be insured, and thus lawyers are more likely to sue these firms as there is an entity that may pay out. Kritzer and Vidmar find that many plaintiffs’ lawyers are reticent about taking on uninsured lawyers and that many personal services sector lawyers do not carry insurance, leading to fewer claims and less successful claims against lawyers in this “hemisphere.” The authors conclude the chapter by outlining the difficulty in researching this topic, as data is difficult to obtain and tends to be patchy at best. Nevertheless, the authors were able to gather high-quality data from several sources, including insurance companies and state regulatory agencies, to help paint a vivid portrait of the state of legal malpractice and access to justice in the United States. Chapter 2 contains ten illustrative case studies that help demonstrate the types of legal situations that give rise to legal malpractice claims. The authors divide the cases into two types based on the “hemisphere” of legal practice in which the case arose, with five cases being drawn as examples from the personal [*13] services sectors and the remaining five selected from the business or corporate legal services hemisphere. These cases illuminate the kinds of legal malpractice that lead to LPL claims, including missing a deadline, breach of fiduciary duty, negligence, and bad legal advice. In Chapter 3, Kritzer and Vidmar build upon the case examples in the previous chapter by elucidating upon the terminology and institutional frameworks that are used in processing LPL claims. First, the authors detail the common insurance arrangements for legal malpractice, noting that the availability, nature, and amount of coverage for lawyers’ professional liability varies by “hemisphere,” with corporate service firms often insured through “towers” of coverage that stack and provide layers of protection while lawyers practicing in the personal services sector are often underinsured or not insured at all (pp. 43-46). The authors additionally examine the unique situation in Oregon, where uniform coverage is provided throughout the state and all lawyers are required to carry LPL insurance — a requirement no other state has. Both in this chapter, and throughout the remainder of the book, Kritzer and Vidmar find that Oregon is an outlier in LPL claims for this reason, with less disparity between the two hemispheres observed in Oregon’s claim’s relative to those in other states. This chapter also provides detailed analysis of the types of claims common in LPL, including negligence, breach of fiduciary duty, breach of contract, and fraud. In presenting the various legal issues that are involved in these claims, the authors demonstrate the key differences between legal malpractice and other malpractice or civil torts cases, notably that plaintiffs must demonstrate “provable financial loss” in most cases and that the outcome of their original case would have been different had their lawyer not committed the alleged error (p. 54). This leads to many LPL trials, as discussed in detail later in Chapter 6, involving a “case within a case” as the plaintiff demonstrates how their original claim would have prevailed (p. 55; pp. 146-146). This is especially difficult with criminal legal malpractice cases, as most states require plaintiffs to demonstrate their “actual innocence” of the accused crime in addition to making the case regarding the error or misconduct by their lawyer (pp. 56-57). The authors conclude this chapter by detailing the marked differences between LPL claims and medical malpractice claims, including disparities in insurance coverage, claims resolution, and legal representation. It is noteworthy, for example, that most LPL claims are handled by plaintiffs’ lawyers who rarely take these cases, in contrast to medical malpractice claims which are often litigated by lawyers who devote a significant amount of their practice to such cases. After covering the preliminary background information necessary for such a complicated topic, Chapters 4-6 contain the results of quantitative analyses of LPL claims and their outcomes, while Chapter 7 uses a more qualitative approach to garner insight from lawyers and practitioners who routinely handle these claims. Specifically, Chapter 4 uses statistical data obtained from various sources to understand the scope and nature of LPL claims made to insurance companies. While the data is not comprehensive nationally, as reliable figures could only be obtained from a sample of states, the authors make a convincing case for its generalizability and representativeness of LPL claims. Kritzer and Vidmar find that claim rates in Oregon, where LPL coverage is mandatory, significantly exceeds those from other states. Furthermore, claims are more common in some legal practice areas, such as plaintiff’s personal injury and real estate, than in other areas such as criminal defense or personal injury defense (p. 73). This is likely due to the high burden of “actual innocence” the authors discussed in Chapter 3, making it very difficult for victims of legal malpractice in criminal cases to find a lawyer willing to handle a claim. Perhaps the most significant finding in this chapter is the evidence provided to support the “two hemispheres” theory in LPL claims, as “lawyers in the corporate sector are much less likely to have a liability claim brought against them” (p. 91). The authors pose several convincing explanations for why this is the case, but they all stem from the vast gulf in clients, legal practice areas, and work styles that span the two [*14] hemispheres of legal practice in the United States. In Chapter 5, Kritzer and Vidmar go beyond investigating patterns in the incidence and nature of LPL claims to better understand the outcome of these claims. The authors look at how often these claims become lawsuits, the success rates of those filing claims, and the nature of payments made in response to LPL claims. They find that on the whole, less than half of all claims become lawsuits and that the likelihood of an LPL claim developing into a lawsuit varies by the alleged error, as fraud and violations of civil rights were far more likely to result in litigation than missing a deadline or a clerical error (p. 98). Turning to the outcomes of these claims, the authors find that the success of claimants varies by state, legal practice area, and the alleged error committed, but tends to fall below 40 percent in most cases (pp. 101-105). Finally, Kritzer and Vidmar address the payments made from LPL claims, finding trends suggesting that the amount paid varies along the same fault lines noted above and indicate differences between the two hemispheres as well. Chapter 6 focuses on claims that developed into full-scale litigation by investigating the incidences and outcomes of LPL claims that went to trial. As with previous chapters, the authors assemble data from several sources on LPL claims that went to trial and find that, on the whole, “between 2 and 3 percent of LPL claims lead to trial verdicts” (p. 126). Looking at the outcomes of these trials, Kritzer and Vidmar find in some data sources that the trends in legal malpractice cases do not substantially vary from other civil malpractice cases where the plaintiff wins about half the time, while other sources suggested a lower win rate and that bench trials tend to be more favorable to lawyer-defendants in LPL cases over jury trials (p. 137). Based in part on these findings, the authors conducted an experiment to simulate juries in LPL trials to better understand this difference, but the results did not lend strong support for juror hostility against lawyer-defendants in LPL cases (p. 140). Lastly, the authors indicate that their empirical analyses of LPL claim trials did not suggest major disparities along the two-hemispheres lines noted in other chapters. This may be, as they note early in the chapter, a result of the inherent uncertainty of trials and due to the prevalence of settling a case before a verdict by insurance defense lawyers that is demonstrated from interviews discussed in Chapter 7. In Chapter 7 the authors turn from quantitative data to a more qualitative approach to understanding LPL claims. By using interviews with twenty lawyers and practitioners who routinely handle all phases of legal malpractice cases, including plaintiffs’ lawyers, insurers and claims handlers, and insurance defense lawyers, the authors garner several interesting insights. For example, few plaintiffs’ lawyers devote a large portion of their practice to LPL claims cases, with those who do only handling a few cases at a time (144-145). Other noteworthy findings on the plaintiffs’ bar include that most plaintiffs’ lawyers receive their LPL cases from referrals from other lawyers and, as noted above, many lawyers are reluctant to take legal malpractice cases arising from a criminal defense or from errors committed by an uninsured lawyer (pp. 146-148). Interviews with insurers noted that a substantial amount of effort and energy in LPL claims was put into “claim repair,” whereby the insurance company deduces if the underlying problem can be addressed without litigation and attempts to repair the claim (p. 157). Both insurers and insurance defense lawyers also brought up the key point that LPL claims that did advance into lawsuits were highly likely to be settled if the insurer lost at summary judgement and the case appeared destined for a full trial (pp. 159-161). All things considered, perhaps the most important finding throughout the interviews were comments made that provided ample support for the two-hemispheres perspective in LPL claims. For example, plaintiffs’ lawyers said they were likely to turn away LPL claims cases where they believed there was malpractice, but the lawyer was uninsured or if monetary damage was unclear. Moreover, both plaintiffs’ lawyers and insurance defense lawyers noted that the majority of LPL claims cases were handled by plaintiffs’ lawyers with little to no experience in this area of legal practice, leading [*15] to avoidable error and perhaps lower rates of success for their clients. Overall, this helps support Kritzer and Vidmar’s claim that access to justice, especially for clients of uninsured lawyers who commit malpractice, is extremely difficult for many to achieve in the United States. In concluding their study, Kritzer and Vidmar present several sound policy proposals in Chapter 8 that are worth serious consideration as tangible methods to resolve the disparity in access to justice for victims of legal malpractice across the two hemispheres. First, the authors suggest implementing an Oregon-style form of mandatory LPL insurance in all states. This is also consistent with many other major democratic countries, including 19 members of the European Union. Short of this, the authors recommend that clients should at least be informed of a lawyer’s insurance coverage and perhaps that there should be stiffer penalties for not carrying LPL insurance. Second, Kritzer and Vidmar propose other alternatives such as a legal services ombudsman, not markedly different from a similar agency in England, who could help resolve LPL claims without burdening claimants with the need for additional legal representation. Finally, the authors suggest reforms in the way LPL claims are handled, including fee shifting, allowing non-economic damages and the loss-of-chance doctrine to apply, and modifications and clarity in statute of limitations doctrines and their application in LPL claims (pp. 179-184). This book has many notable strengths, including its mixed-methods approach and its ambition in tackling immense data limitations to study such an important and under-examined topic. I firmly believe, though, that the greatest strength is that this study provides crucial insight into the disparity in access to justice for victims of legal malpractice, and then goes on to provide tangible solutions to this important problem. That being said, there are a few important limitations of this study that bear mentioning. First, the authors rely on a patchwork quilt of data from a variety of sources, some private and some governmental, to paint their portrait of LPL claims. By necessity then, the data employed for the quantitative analyses throughout the book suffer from potential generalizability concerns as many large or populous states are excluded from much of the empirical discussion. Second, the sometimes arcane and technical nature of the insurance and legal malpractice fields may contribute to a writing style in several places in the book that relies a little too much on acronyms and nuance that may be difficult for some general readers. Nevertheless, the high merit of the work on the whole and its significant contribution to understanding and fixing the access to justice gap helps to more than overcome these limitations. Overall, I highly recommend this book to scholars and students in law, political science, socio-legal studies, and public policy, as the most important and likely enduring work on legal malpractice in the United States. Furthermore, I would recommend it to lawyers who practice or are hoping to practice in LPL, as well as policymakers who are interested in better understanding legal malpractice and improving access to justice for its victims. This study contributes greatly to our understanding of not only the way LPL claims are handled, but also to larger debates about malpractice and civil justice. I hope that it is widely read and discussed and can help advance these conversations to contribute to reform that can expand meaningful access to justice for all victims of legal malpractice in the United States. © Copyright 2019 by author, Jared Perkins.